CDMG Case Study: Investment Seminars, Inc.
A “Money Show” brings together thousands of millionaires and hundreds of investment marketers for an event that is literally an extraordinary celebration of capitalism. Gurus forecast. Deals are done. It’s a frenzy of activity and action. 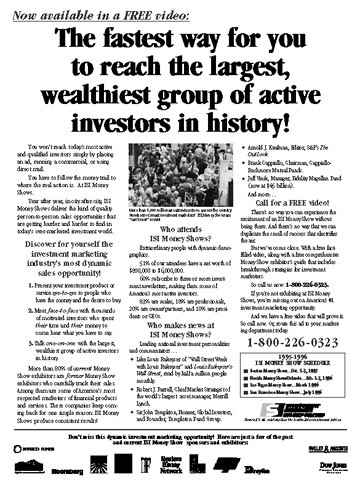 Operating four major Money Shows a year, Investment Seminars Incorporated (ISI) needed powerful promotions and advertising that dramatically illustrated what Money Shows offered exhibitors. To bring the excitement of an ISI Money Show to potential exhibitors, a video was created that was, literally, “the next best thing to being there.” Then CDMG created an advertisement that told the ISI Money Show story—the audience, the financial stars and the excitement. And, the ad also offered the free video. Each ISI Money Show attracted 8,000 or more investors. More than 80% of the exhibitors returned to exhibit at these same shows the following year. Of the investment marketers who called requesting the video and additional information from this show, over one-third became show exhibitors. Call or contact Creative Direct Marketing Group NOW and see how CDMG can help you increase your response and your profits. There is no cost or obligation for your first consultation.